Happy New Year! It’s the first Date Night of 2013, and to commemorate the occasion, we are headed to the restaurant that is first on many lists in Atlanta. 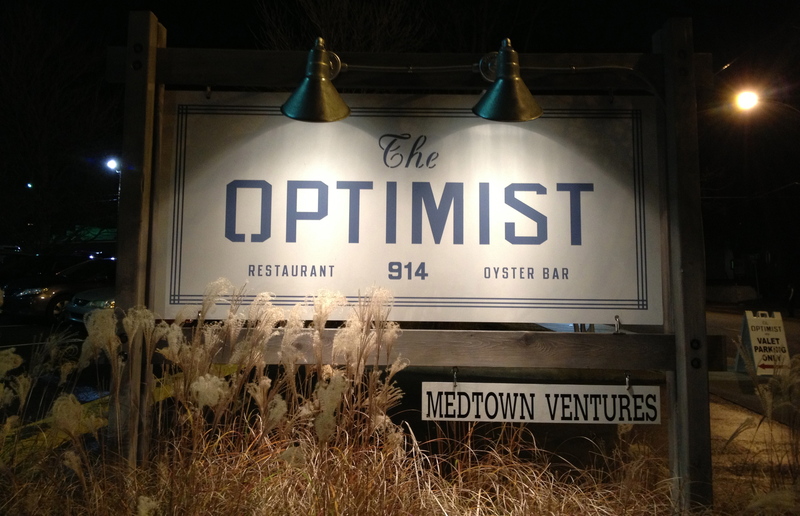 The Optimist is the most blogged about restaurant in Atlanta as well as Esquire Magazine’s Restaurant of the Year for 2012. 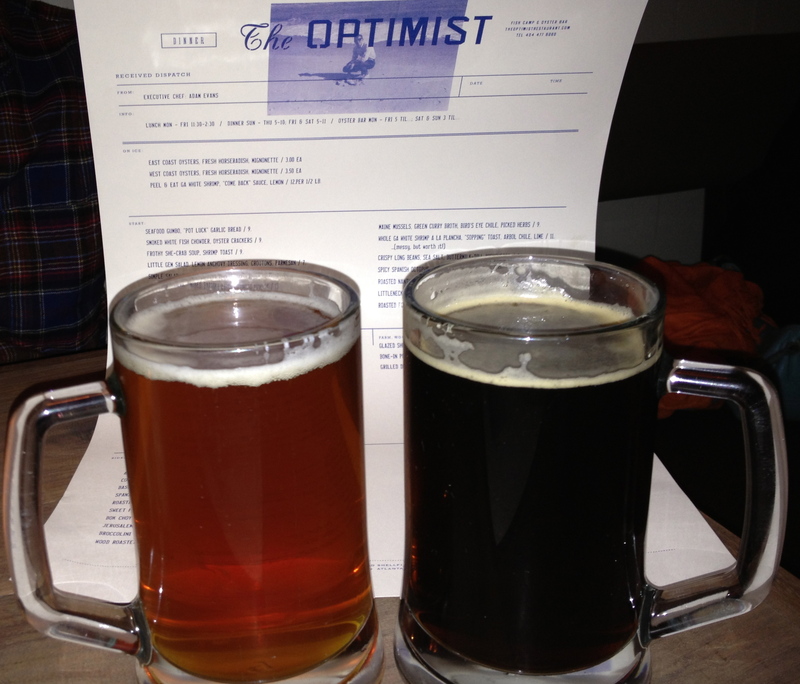 Because of all the great press, Date Night is “optimist-ic” that we are going to have a great meal tonight. Culinary excellence on the Westside. 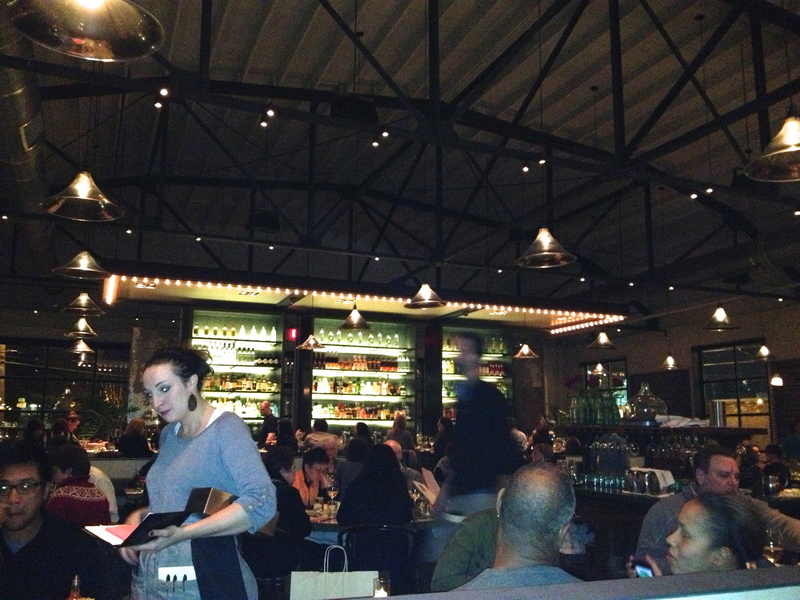 We are back on the Westside, right across the street from Bocado, where we visited on Date Night #47 at the end of October. 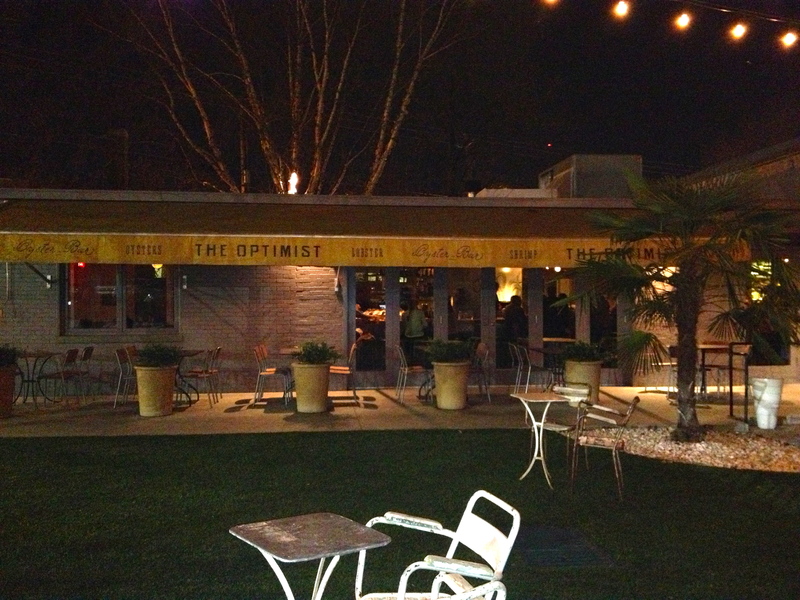 Like a lot of eateries in the area, The Optimist is located in an old warehouse building. The decor is supposed to remind us of a fish camp. A patio and putt-putt greet you at the entrance. It’s a cold night, and we can only imagine how fun it would be to eat outside while playing a little miniature golf on the putting green in front of the restaurant. We arrive a little early for our 7:15 reservation and expect to spend some time in the restaurant’s oyster bar, but we are promptly shown to our table by a very friendly hostess. While we wait for our waitress, we get a special delivery. 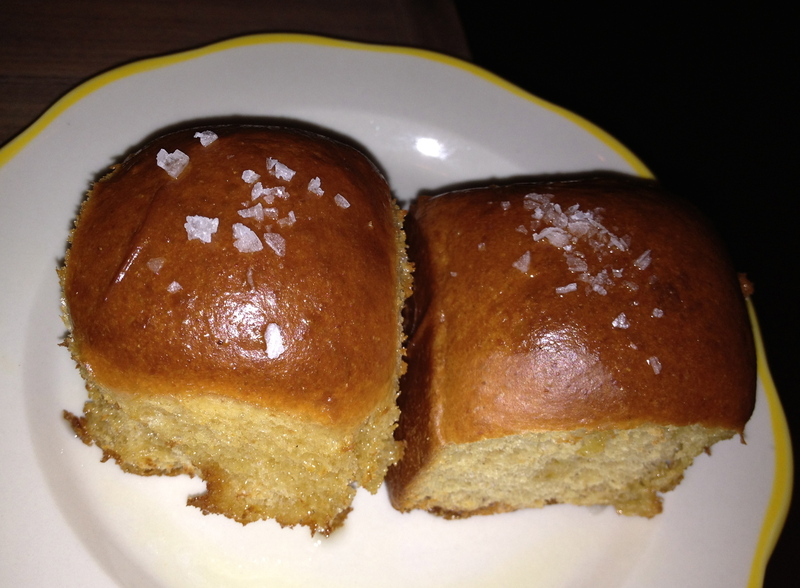 The house-made yeast rolls need no butter because it’s baked right in there. I could eat two or three of these and call it a perfect meal. Our waitress Megan appears and goes over the drink menu with us. Her menu knowledge is amazing and she basically has everything memorized. There are a lot of fancy holiday drinks still on the menu including hot buttered rum and coconut eggnog. They all look great, and I am tempted to stray from the beer menu. The draft beer list features beers from the coast tonight. We go California coast, with an Anchor Christmas Ale from San Francisco and a North Coast Red Seal Amber from Ft. Bragg. An amber and a brown. While we decide on our appetizer, let’s look around the restaurant. 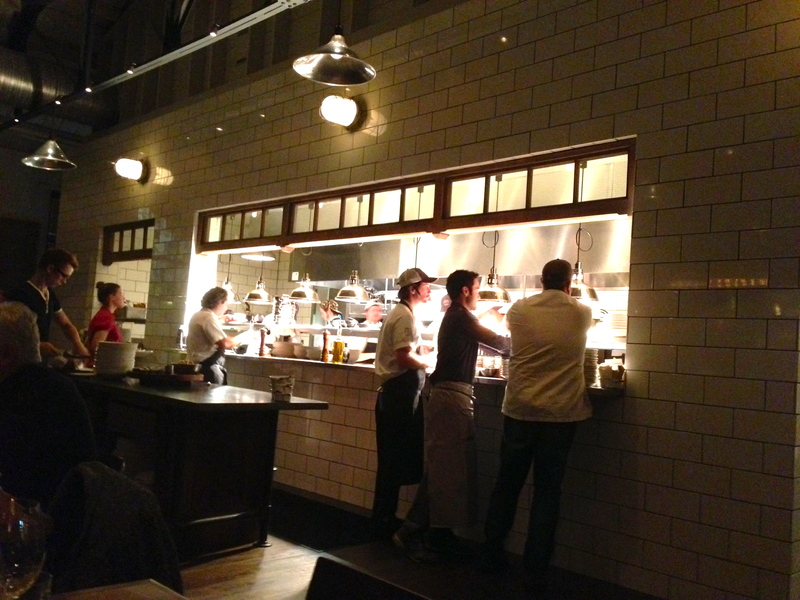 On one end is the open kitchen, which is a where the action is. Lots of good food comes out of here. On the other end is a well-stocked bar, where there is also a lot going on. The view from the other side. That’s Megan in the lower left. There are many excellent appetizer choices, from gumbo to fried oysters to spicy octopus. Since we are at a seafood restaurant and we both worked out today, we split an order of mussels. An order of marvelous mussels. They come in a Thai coconut sauce that is a little sweet and a little spicy. 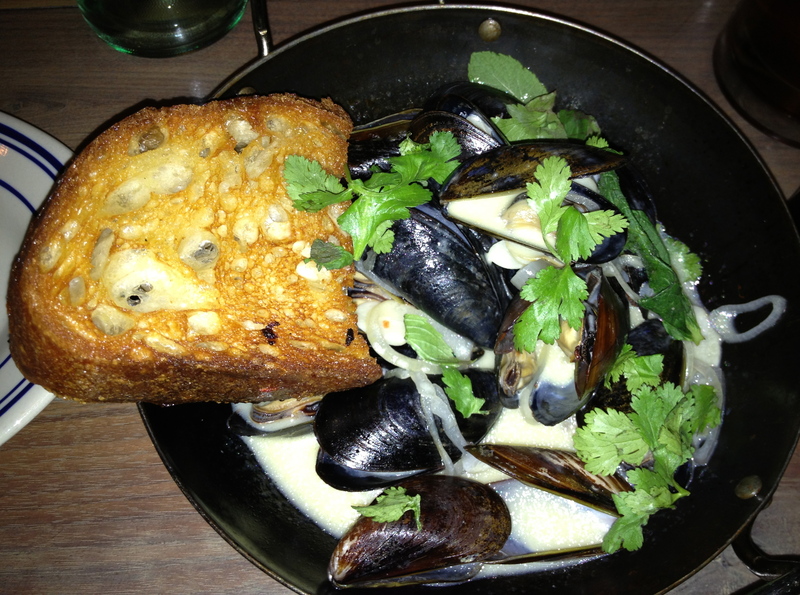 The mussels are plump and juicy. We split the toast to sop up the sauce. Megan notices that we need more bread, so she brings us a couple of extra pieces to help in sauce sopping. We are suckers for anything cooked in duck fat, so for our entree, we split an order of swordfish poached in the aforementioned high-calorie, artery-clogging stuff. Swordfish poached in duck fat. Everything is a la carte on the menu, so we get to order some side dishes. 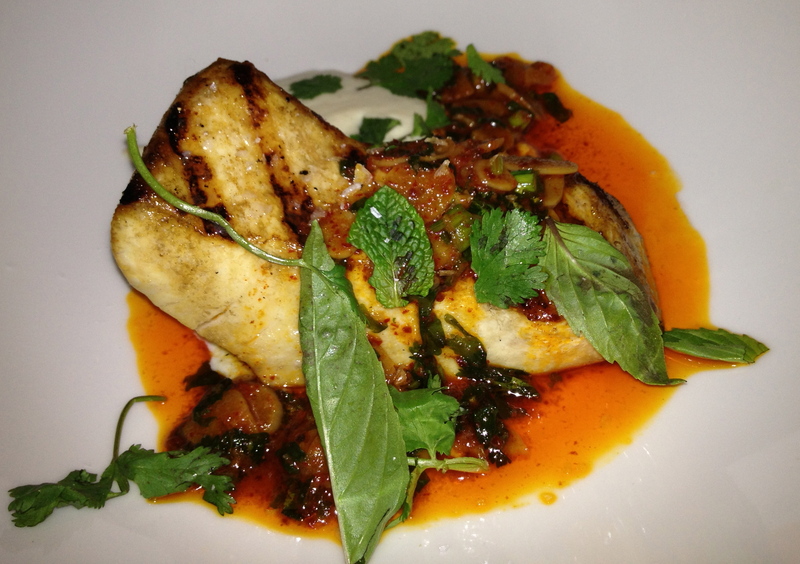 It’s a tough decision, and since the swordfish is not a huge portion, we order three sides to go with it. They look like beignets, but they are really hush puppies. 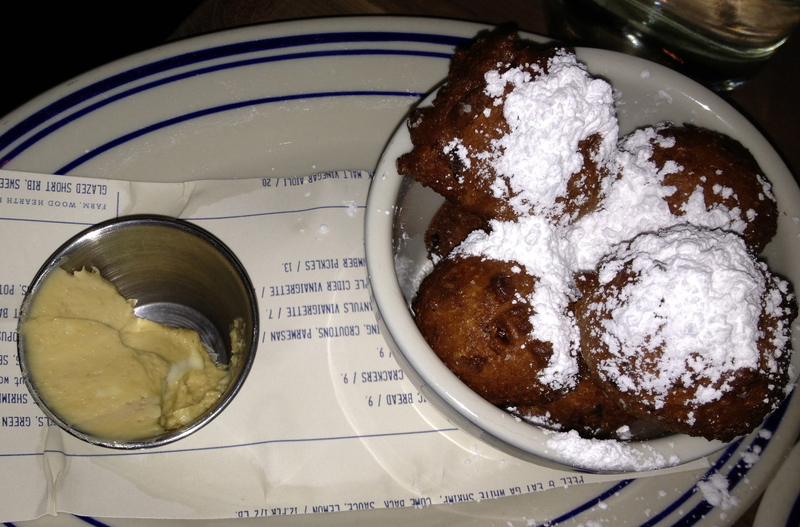 The house specialty is the hush puppies, which are served beignet-style. That means they are covered with powdered sugar. We each get three of them, and I could have eaten a lot more. They are sweet, not only from the powdered sugar, but from the ingredients within. How about some artichokes with your meal? 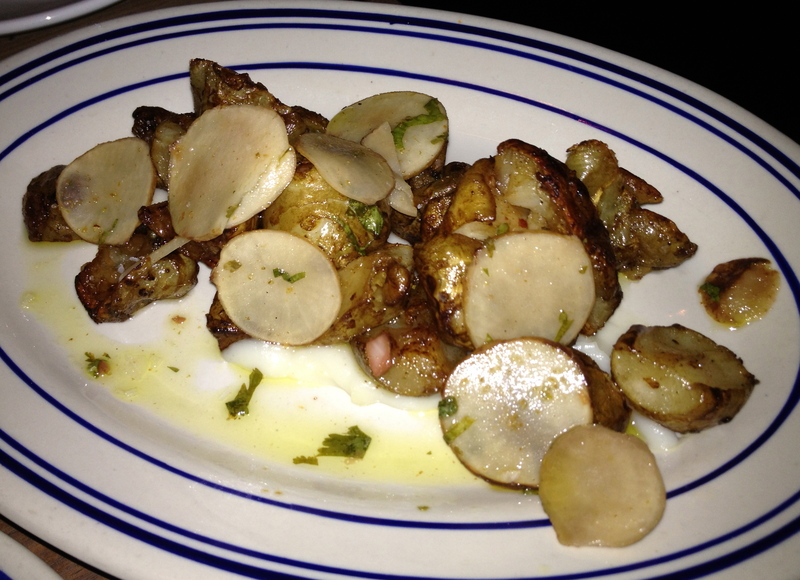 There are three different tastes of artichoke on the plate. On top of the artichoke puree is roasted artichoke. It’s all topped off with pickled artichoke. We never knew that artichokes could taste this good. 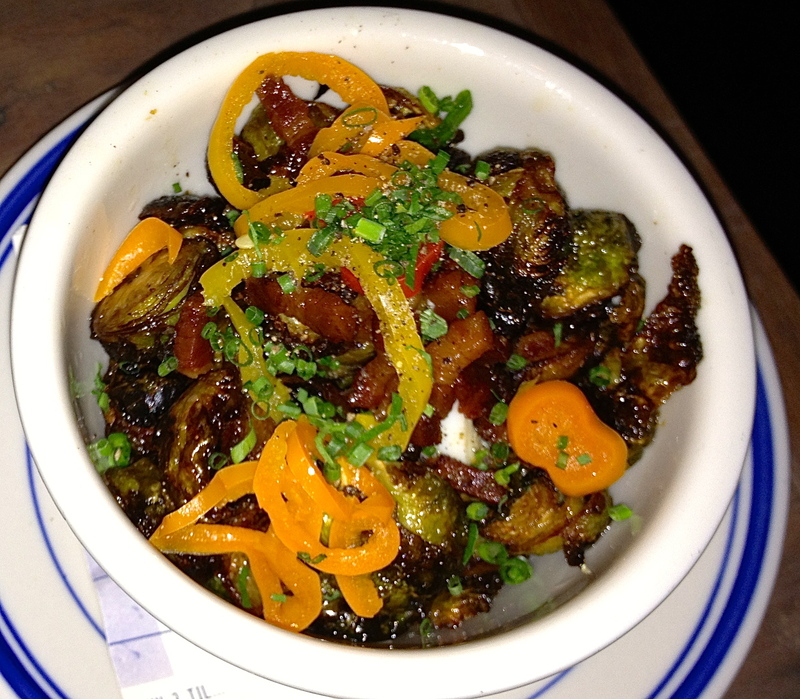 Our loyal readers know that we have a thing for Brussels sprouts these days, so we select them for our third side. Brussels sprouts–we never pass them up! These come with bacon, which give them an amazing flavor. They are cut into pieces, which makes them delicious Brussels morsels. We really enjoy this version of our new favorite vegetable. We are pretty full by now, but when we find out that Optimist pastry chef Terre just won $10,000 on Food Network’s “Sweet Genius” the night before, we must try one of her creations. Unbuckle your belt and make room for apple buckle. 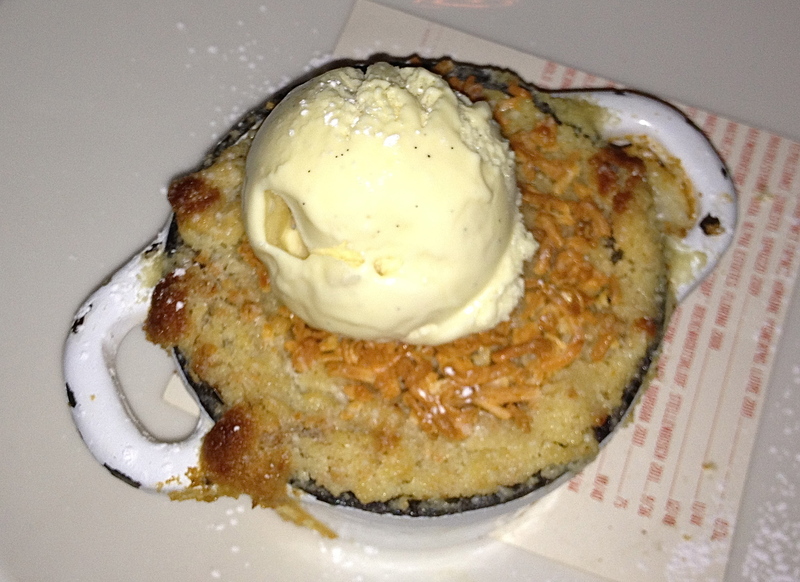 The apple buckle comes in a cast-iron pot. It’s an apple cake and an apple pie in that cute pot. It’s topped with a sharp cheddar cheese, which is how they eat their apple pie in some of the northern states. We can see why Terre is a “Sweet Genius” and her apple creation is a great way to put a ribbon on this gift of a meal. Before we leave, a word about the service at The Optimist. It’s wonderful. Everyone there is so nice and friendly. They all walk around with smiles on their faces and they should. The place is a huge success and they know it. When we finish eating around 9:00, it’s still packed and there are people arriving for their late reservations. You’ll need a reservation when you go, and we suggest you get one as soon as you can. You are going to have a great meal and a truly rewarding dining experience.